This security poster illustrates the TMRP-6 Yugoslavian Anti-Tank Mine. The underside of this anti-tank mine is fitted with an anti-lift fuze well. The mine is a complicated one that operates by pressure of using a tilt rod mounted on top of the mine. The mine features a clockwork arming mechanism. This security poster features a labelled sectioned view or an armed TMRP-6 as well as illustrations and descriptions on how to disarm the TMRP-6 Yugoslavian anti-tank mine, including extra explanations and illustrations for the TMRP-6’s boobytraps and clearing the TMRP-6. A labelled sectioned view or an armed TMRP-6. Illustrations and descriptions on how to disarm the TMRP-6 Yugoslavian anti-tank mine, including extra explanations and illustrations for the TMRP-6’s boobytraps and clearing the TMRP-6. 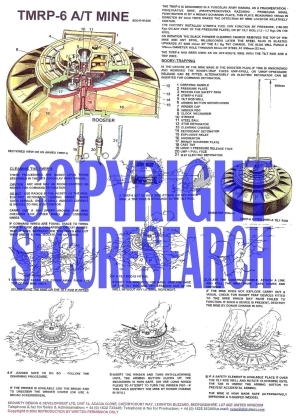 This security poster features a labelled sectioned view or an armed TMRP-6 as well as illustrations and descriptions on how to disarm the TMRP-6 Yugoslavian anti-tank mine, including extra explanations and illustrations for the TMRP-6's boobytraps and clearing the TMRP-6.